Sega US boss Simon Jeffery wasn't the only big name in the industry who felt that this year's E3 Expo lacked a certain livelihood. 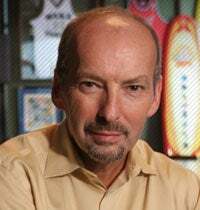 Former Microsoft tattoo bearer and current EA Sports head man Peter Moore says that last week's event was "soulless and lacking an epicenter". All is not lost though. In a post on his official blog late last night, Moore assures us that the problems can be fixed, and that getting the fans involved is the key. We're confident that we can work with the ESA to make this right. There are important meetings ahead that we think will be substantive and be productive in finding the right path forward. Let's invite the community. With the right planning, involving our biggest fans in E3 would bring back some of the raw passion the event has lost. A stance sure to be popular with fans, but how to make it work without hampering access to the publishers for members of the press? I suppose it could be solved by keeping the meeting rooms we had this year, and adding a centralized show floor where the publishers can set up their fancy kiosks. Gamers can access the show floor proper, press still has easy access to their private showings and meetings, and in case we need a little fan reaction to the new games we've got an absolute sea of people to pull aside and give the old man-on-the-street treatment. As Crecente said earlier this week, reporting nirvana. It sounds like a winning combination to me, though frankly it sounds like several of the other game conventions that have sprouted up during the decline of E3 over the past few years. Bring the life back to the show without making it just another show - now that's the challenge.